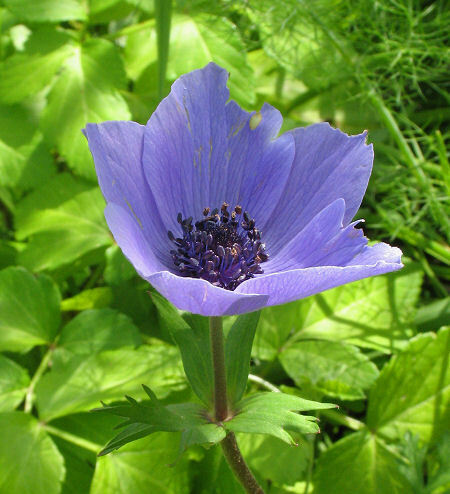 Anemone coronaria (Crown Anemone) : MaltaWildPlants.com - the online Flora of the Maltese Islands. Cultivated fields or nearby waste places, frequently found in fields near valleys. Plant 15-45 cm. Basal leaves biternate, the segments deeply lobed. Cauline leaves deeply cut into narrow divisions. Flowers 3•5-6•5 cm in diameter, solitary. Perianth-segments 5-8, elliptical, red, purple, pink, blue or white. Anthers blue.